columnist Ellen Goodman understood what many reporters still don't get. In a previous post to this blog, I discussed how actual experts on substance abuse keep pleading with reporters not to make the same mistakes in covering the opioid epidemic that they made covering the crack epidemic – in which coverage was infused with hype and hysteria that did enormous harm to children. I discussed how the Washington Post ignored all of those warnings. Perhaps because the stories were written by a longtime health reporter, they show more care than most when discussing the health effects of opioid use on infants. But to know how child welfare should respond to opioids, knowing about opioids isn’t enough. 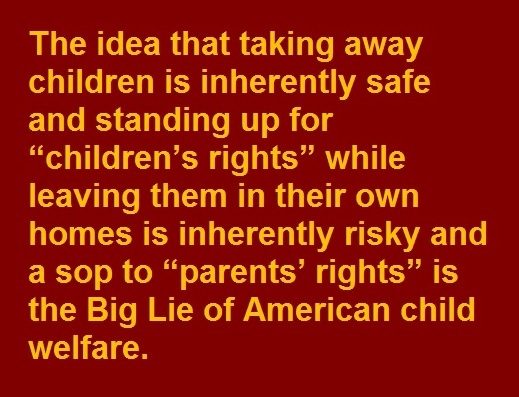 You need to understand the realities of child welfare. That’s where the story fails. In contrast, a much smaller newspaper, the Missoulian, and some outstanding journalism students covered the issue with far more insight and nuance. In discussing the “debate” over when to turn in mothers to child protective services, the only “sides” discussed by the Inquirer are whether to turn in those who use all drugs or only illegal drugs. 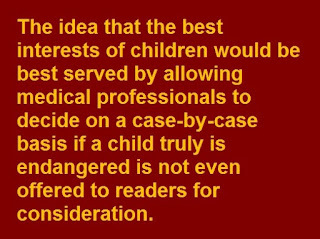 The idea that the best interests of children would be best served by allowing medical professionals to decide on a case-by-case basis if a child truly is endangered is not even offered to readers for consideration. 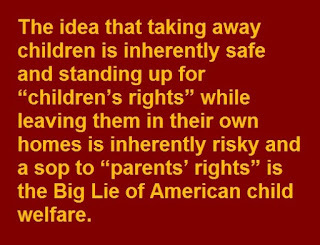 The idea that taking away children is inherently safe and standing up for “children’s rights” while leaving them in their own homes is inherently risky and a sop to “parents’ rights” is the Big Lie of American child welfare. Framing the debate as “infant safety vs. respect for moms” is a way of tailoring that Big Lie to cases involving substance use. The real debate is: What is in the best interests of children – automatically turning in their mothers, or respecting professional expertise? But Inquirer readers will find that nowhere in the story. The reporter herself declares at the top of the story that the infants “are known to be at higher risk of neglect or abuse when they go home with mothers battling addiction.” Later she suggests that even mothers who are in treatment and taking legally prescribed opioids, such as methadone, as part of their treatment, should be turned in to authorities – because, she suggests, you never know when those awful moms will relapse. University of Florida researchers studied two groups of children born with cocaine in their systems; one group was placed in foster care, another left with birth mothers able to care for them. After six months, the babies were tested using all the usual measures of infant development: rolling over, sitting up, reaching out. Typically, the children left with their birth mothers did better. For the foster children, the separation from their mothers was more toxic than the cocaine. And if the reporter were truly concerned about what puts children at “higher risk of neglect or abuse” she would have noted the many studies showing abuse in one-quarter to one-third of foster homes. 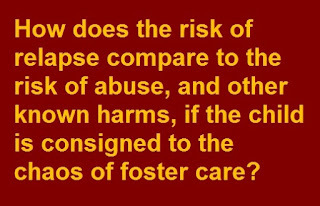 She also would have shared with readers the data on the long term awful outcomes for children consigned to the foster care system - and how, in typical cases those outcomes are worse than the outcomes even for comparably-maltreated children placed in foster care. Links to all of these studies and data are available here. 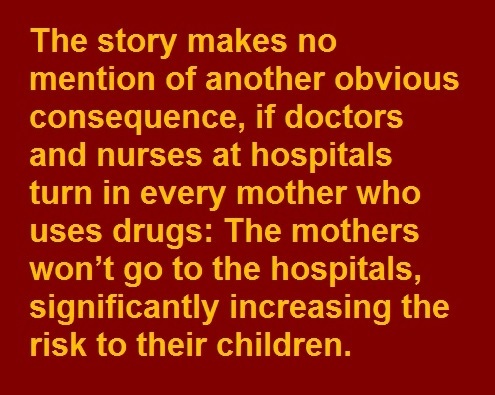 There also is no mention of another, obvious consequence, if doctors and nurses at hospitals turn in every mother who uses drugs: The mothers won’t go to the hospitals, significantly increasing the risk to their children. The story says that “when women use drugs during pregnancy, they are more likely to neglect prenatal care …” Note the contemptuous term “neglect.” In some cases that’s accurate; in some cases far worse terminology would be accurate. But in other cases, the mothers can’t get prenatal care due to poverty, don’t know how to find it or are afraid to seek it out, precisely because they fear being turned in to child protective services. Fewer pregnant women with substance-abuse addictions are seeking treatment and prenatal care -- out of fear they will be arrested or lose custody of their children, according to Utah officials who counsel and treat them. While Utah prosecutors have not charged a substance-abusing pregnant woman with felony child abuse since January 1998, the fear of legal reprisal apparently still exists, said Lynn Martinez, program manager for the Pregnancy Risk Line at the Utah Department of Health. "We've been in business for 15 years. Last year and so far this year have been the worst as far as the number of substance-abuse referral calls," she said. "We're probably getting about half the number of calls we are used to." Donald Dudley, an obstetrician specializing in high-risk cases at University Hospital, said he has noticed a drop. "And it's not like they're all of a sudden getting better and not using drugs," he said. "I have patients who are methadone users, so they're out there. But I think there is a lot of fear out in the community about this issue. A lot of them have been driven underground." [A] growing body of evidence suggests that what these babies need is what has been taken away: a mother. Separating newborns in withdrawal can slow the infants’ recovery, studies show, and undermine an already fragile parenting relationship. When mothers are close at hand, infants in withdrawal require less medication and fewer costly days in intensive care. “Mom is a powerful treatment,” said Dr. Matthew Grossman, a pediatric hospitalist at Yale-New Haven Children’s Hospital who has studied the care of opioid-dependent babies. That doesn’t mean we can simply leave children with hopelessly addicted parents. But it does mean that in most cases, drug treatment for the mother is a better option than foster care for the child. To which those supporting turning in all parents probably would say: But that’s all we want! 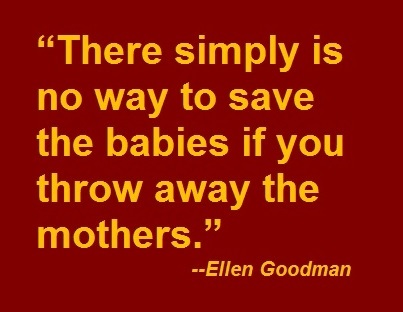 We just want the moms turned in so child protective services can decide what kind of help to give them. the goal is to help families, not target struggling women. “In crafting the federal law, I never envisioned that the ‘referral’ from a health care provider was the same as a child abuse report,” said Greenwood, a former child protection caseworker. 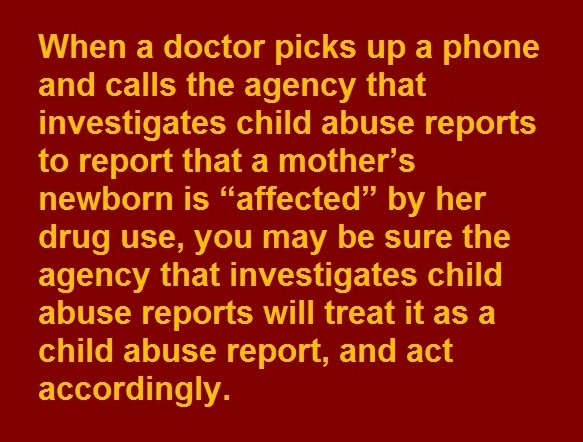 investigates child abuse reports to report that a mother’s newborn is “affected” by her drug use, you may be sure the agency that investigates child abuse reports will treat it as a child abuse report, and act accordingly. That doesn’t mean the child automatically will be removed to foster care. 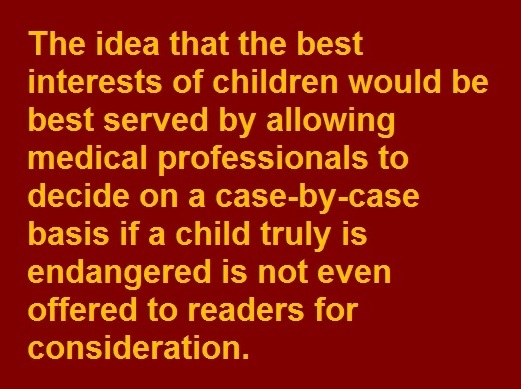 But why should we assume that the judgement of a typically inexperienced, underprepared minimally-qualified caseworker for a child protective services agency is superior to the judgment of medical professionals? 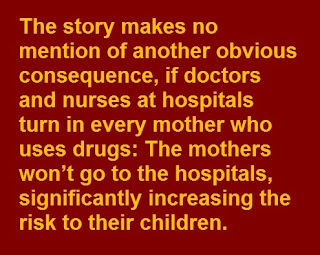 And the Utah experience suggests that, once the word gets out that hospitals have to turn in all drug using mothers, a lot of those mothers will steer clear of hospitals. One side of the debate argues that hospitals should report all drug-exposed babies to local child protection agencies, while the other side says only babies whose mothers used illegal drugs should be reported. Behind the distinction are good intentions. Many women work to control their misuse of legal or illegal drugs with counseling and prescribed opioids — namely, methadone or buprenorphine — that prevent wrenching withdrawal symptoms. Some are taking prescribed opioids for chronic pain under a doctor’s care. What’s more, women who are motivated to quit drugs altogether when they discover they’re pregnant are typically prescribed methadone, because going cold turkey increases the risk of miscarriage. But newborns exposed to legally prescribed opioids still can suffer withdrawal — and still can be at long-term risk of neglect or abuse, given the chronic relapsing nature of addiction. In other words: Drug using moms: Threat or menace? ● How does a referral to child protective services now diminish the possibility of relapse months or years from now? 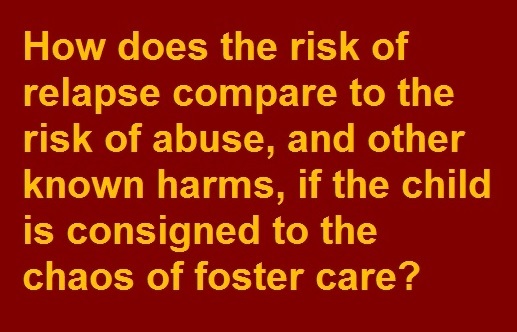 ● And most important: How does the risk of relapse compare to the risk of abuse, and other known harms, if the child is consigned to the chaos of foster care? 1. 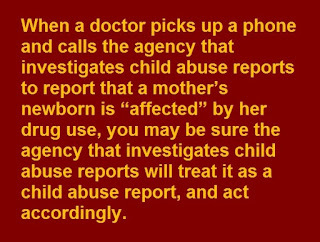 Do not allow child protective services to accept reports based solely on a mother’s use of legally prescribed medication to control drug abuse. It should be presumed that the risk to a child posed by such a mother – who is already under medical supervision and getting treatment – is less than the risk caused by involving child protective services and placing the child at risk of foster care. 2. Change state laws to give medical professionals discretion to determine when a mother’s substance abuse presents such a danger to her child that a report to child protective services is necessary. 3. Where drug treatment is needed, make it as easy for a doctor or nurse to get a new mother into a high quality drug treatment program as it is to call a child abuse hotline. In some cases those medical professionals will get it wrong. They will fail to report some children in real danger, and also report some children who are not, in fact, in danger. But they are likely to make fewer errors than a system that requires a knee-jerk report to child protective circumstances in all circumstances. I don’t expect the reporters and editors at the Philadelphia Inquirer to rush out and endorse this approach. I would hope they could bring themselves to at least share the existence of this side of the debate with their readers. Of course, it’s easy to write off any request from an advocate as biased. And in this case, those who would make such a claim have a point. Because I am biased in this debate. I’m biased toward the child. *-The story does not appear to be available online. NCCPR has a copy.